Mercedes’ luxury GT may be costly to run, but how can you not be tempted when you can grab one for as little as £2500? Last November Glass’s Guide declared the C215 version of the Mercedes-Benz CL500, which ran from 2000 to 2007, its used car hero of the month. In fact, the CL might be used car hero of the decade, not just the month. As the guide noted, good used ones are available for around £7000 – or a tenth of what they cost new. In fact, prices start at around £2500. That is the money one dealer is asking for his 2001/X-reg CL500 with a heroic 160,000 miles and full service history. Unfortunately, he describes the suspension as ‘Airmatic’, which it isn’t. In so doing, he has unwittingly drawn attention to the CL’s Achilles heel and the main reason it’s such spectacular value: its Active Body Control suspension. Basically, a pump sends oil around the car’s four interconnected dampers, varying the pressures in each to maintain a stable ride and improve body control in corners. At high speeds, it lowers the car by up to 25mm. It’s a brilliant but unreliable piece of kit and costs a fortune to put right. An acquaintance who owns a CL55 AMG (and loves it to bits) told me he has spent £16,000 on it in the past six years, much of it on the suspension, the rest on servicing and tyres. His dedication to the four-wheeled money pit on his driveway speaks volumes about the more positive aspects of the big CL. 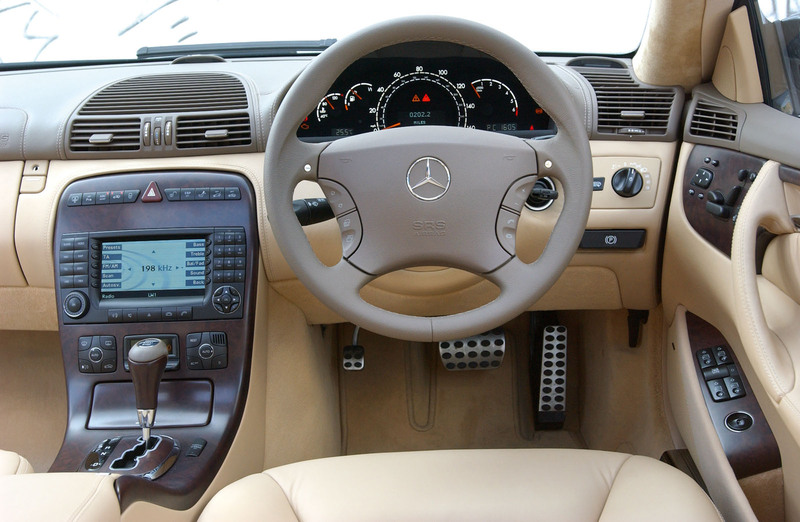 Even the standard CL500 bristled with technical innovations, including the aforementioned trick suspension, and was only the second car (the first being the S-Class) to have Mercedes’ Distronic radar-assisted autonomous cruise control. Naturally, as a flagship model, it was loaded with kit, everything from powered doors and bootlid to electric leather seats and four-zone air-con to parking sensors. Options included a TV and a voice-activated telephone. Much of the infotainment kit is prehistoric by today’s standards, but it’s all part of the motor’s once cutting-edge allure. The CL500 was powered by a 306bhp 5.0-litre V8 and was joined by the sportier 5.4-litre CL55, serving up 360bhp, and a 5.8-litre CL600 V12 with 367bhp. The CL55 needs careful buying, because in 2002 it gained a supercharger (Kompressor) and an extra 140bhp, taking it to 500bhp. Of the two, it’s definitely the one to go for. Small beer? Keep your eyes peeled for the bi-turbo 5.5-litre CL600 with 500bhp and the 6.0-litre CL65 AMG with 603bhp. You’ll need to look hard, because the CL500 dominates the classifieds, and with good reason: it’s the least complicated and kindest on the pocket yet still packs a punch. Early versions of the V8 and V12 suffered water in the fuel caused by fuel tank condensation. On the V12, check for oil weep at the front timing cover caused by a blocked crankcase oil breather; also for oil leaking from the rubber gasket around the oil cooler between the cylinder banks. Change the oil and filter every 10k miles. V8 has twin-spark heads, with one coil pack per pair. Coils are reliable and not too expensive. The V12 has a set of six coils per bank, each set costing £1000. They tend to fail when the plugs are changed. It’s tough. On all models, the transmission can switch to limp-home mode and third gear won’t engage. It’s a gearbox-out job. Check for warning lights. (White: something’s up. Red: run away.) A faulty system will default to the hard, sporty setting. Struts can leak and each costs around £700. Pump control valves (there are two, each costing £1000) can fail, too. Check the strut top links for looseness. Check for water in the passenger footwell caused by a blocked scuttle drain. Much of the wiring connects here and damp will wreak havoc. Aluminium-steel body can rust at the rear wheel arches, the bottom of the doors and the rear screen. It’s robust, but check warning lights relating to safety features. Fear of the unknown is the greatest obstacle to CL ownership, but an official Mercedes used car warranty (go to mercedes-benzwarranty. co.uk) can help. There are two levels of cover. We were quoted £1431 for a comprehensive Tier 1 cover on a 2006 CL500 with 57k miles. Mercedes-Benz CL prices - how much to spend? Launch to 2004 CL500s with 90k to 200k miles and full or partial service histories. Some one-owner cars, too. Lower-mileage (from around 60k to 80k) early and mid-life CL500s in excellent condition. Early to mid-life CL55 AMGs and CL600s, early but low-mileage CL500s and late-plate, average-mileage CL500s. The best CL500s, CL55 Kompressors and CL600s. Extremely rare CL63 and CL65 AMGs. Heroic used car purchase. But the mythical trouble-free V8 for £5k is probably out there, somewhere. Good luck! They're a wonderful car while they're working but I'm not sure I'd agree that they're built that well. They're based on the S Class of a similar age and they were criticised at the time for their poor build quality. Everything is relative, mind.